Country Hollow Village in Haverhill MA was built in the late 80’s between 1986 and 1988 in multiple phases by different builders. 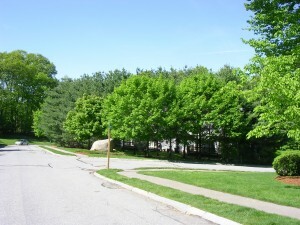 This 90 unit townhouse style complex sits in the country side of Haverhill MA, nestled in between North Broadway and Hilldale Ave close to the Atkinson and Plaistow NH border. One if its main benefits is its quiet, low traffic location and beautiful grounds. There are two different layout choices to the first floor. One style has a larger living room/dining room combo area with a smaller galley style kitchen, while the other has a small more traditional living room separated by a hallway and half bath and then kitchen. Unit sizes are all pretty much the same (except for the detached town homes) coming in around 1500 square feet not including the basement. The stand alone detached town homes are larger with more rooms and an attached garage coming in around 1850 square feet not including the basement. Each unit comes with 2 parking spots (1 in the garage, and one in your driveway) Visitor parking is available down on Country Meadow Lane. Professional offsite management handles all the exterior maintenance and the fee includes: Exterior Maintenance, Landscaping, Snow Removal. Condo fees begin in the $190’s for the attached, garage under style and go higher for the larger detached style unit. 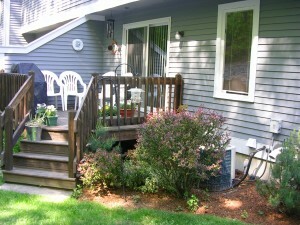 Close to local shopping, amenities and access to Rts 495. Pets are allowed.